﻿ Fun Easy English - Environment - Global warming - Climate change Indicators: Glaciers. 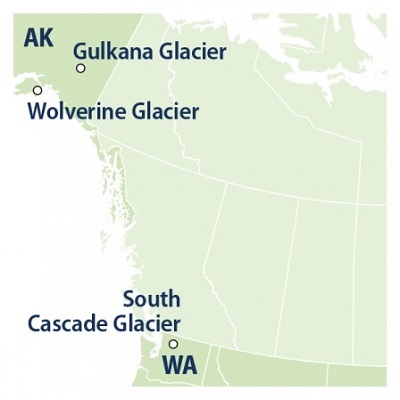 Trends for the three benchmark glaciers are consistent with the retreat of glaciers observed throughout the western United States, Alaska, and other parts of the world. Observations of glaciers losing mass are also consistent with warming trends in U.S. and global temperatures during this time period (see the U.S. and Global Temperature indicator). In many areas, glaciers provide communities and ecosystems with a reliable source of streamflow and drinking water, particularly in times of extended drought and late in the summer, when seasonal snowpack has melted away. Freshwater runoff from glaciers also influences ocean ecosystems. Glaciers are important as an indicator of climate change because physical changes in glaciers—whether they are growing or shrinking, advancing or receding—provide visible evidence of changes in temperature and precipitation. If glaciers lose more ice than they can accumulate through new snowfall, they ultimately add more water to the oceans, leading to a rise in sea level (see the Sea Level indicator). The same kinds of changes occur on a much larger scale within the giant ice sheets that cover Greenland and Antarctica, potentially leading to even bigger implications for sea level. 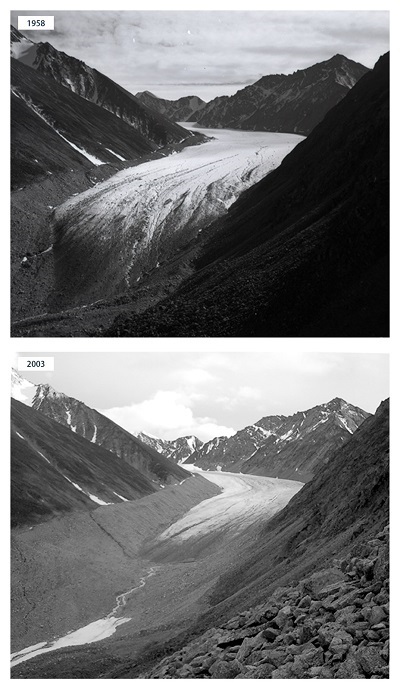 Small glaciers tend to respond more quickly to climate change than the giant ice sheets. Altogether, the world’s small glaciers are adding roughly the same amount of water to the oceans per year as the ice sheets of Greenland and Antarctica. 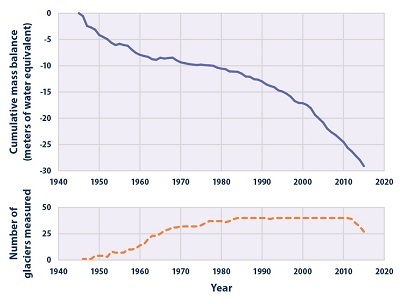 During the last two decades, they added more water overall to the oceans than the ice sheets did. Long-term measurements are available for only a relatively small percentage of the world’s glaciers. This indicator does not include the Greenland and Antarctic ice sheets, although two decades of satellite data suggest that these ice sheets are also experiencing a net loss of ice. Continued satellite data collection will allow scientists to evaluate long-term trends in the future. 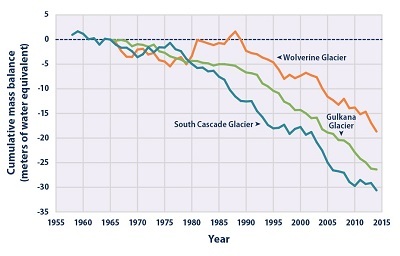 The World Glacier Monitoring Service compiled data for Figure 1, based on measurements collected by a variety of organizations around the world. The U.S. Geological Survey Benchmark Glacier Program provided the data for Figure 2. 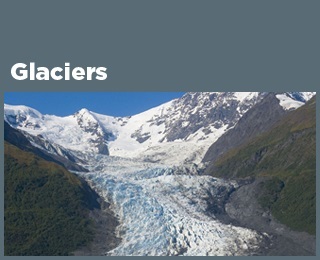 Historical data, as well as periodic reports and measurements of the benchmark glaciers, are available on the program’s website at: http://2.usgs.gov/climate_landuse/clu_rd/glacierstudies/default.asp. Reference map for figure 2 above.